Crossed Wing Collection - Cross Stitch Designs - Birds! 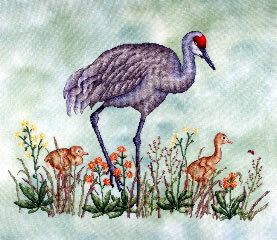 Crossed Wing Collection specializes in realistic and finely-detailed cross stitch patterns of birds. If you enjoy stitching and you enjoy birds, we hope you'll get to know our small company! Click around in our web site to get a detailed look at our cross stitch charts, knotted kits , and hand dyed fabrics. We've got a bit on what we're currently up to, and information on where to find our products..
© Crossed Wing Collection. All rights reserved.